If you’re searching for the best argan oil for hair you’ve come to the right spot! Argan oil is an oil extracted from the fruit of the argan trees that grow exclusively in southwestern Morocco. Moroccan argan oil products have been used for generations by local women as a part of their beauty routine as well as being part of local cuisine. One of the easiest ways to use this oil is in the hair. It’s very easy to do and long-term benefits. To find out the best argan oil and how to use argan oil for your hair keep reading. Argan oil comes from the argan tree. It is a fruit that looks a lot like an olive when it grows. When the fruit is ripe it falls from the tree and is gathered to be processed. The hard exterior of the fruit is removed to reveal the kernal inside. This is what is pressed to make argan oil. After the kernal is free it is pressed to extrude the oil. What are some of the benefits of argan oil? Pure argan oil has many beneficial properties. Argan oil is packed with Vitamin E. This makes it a great natural moisturizer. Unlike some oils, argan oil is not greasy when applied. It is known to have anti-aging properties and has long been used as a natural moisturizer. The antioxidants in argan oil are great for healing, protection, and even pain relief. Hair conditioning. Argan can make hair softer, smoother and shinier without looking greasy. Can help ease the symptoms of psoriasis or dandruff. Is great for a relaxing scalp massage! How do you use argan oil in hair? There are many ways to use argan oil in hair. The easiest, as mentioned earlier is by simply applying pure argan oil to the scalp, shaft and ends of hair. You need not use a lot. There are also many hair care products that include argan oil on the market. Some of the include argan oil shampoo, argan oil conditioner, and argan hair masks. In recent years, dozens of companies have come out with shampoos labeled as argan shampoo. It is really important to know what you are purchasing. 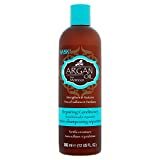 A company need add just a very tiny amount of argan oil to their formula to label it as “argan oil shampoo.” Because argan is an expensive product, many of these shampoos are marked up because of this inclusion but you may not be getting what you think you’re paying for. many are sulfate and paraben free. Sulfate free argan shampoo is especially helpful for people who suffer from psoriasis and/or dry and itchy scalp issues. The best argan oil shampoo for you will depend on what type of hair you have and what your budget is. Below you’ll find a comparison of different, popular argan oil shampoos. Arguably the best conditioner with argan oil is pure argan oil itself. However there are several other Moroccan argan oil conditioners on the market as well as argan shampoo and conditioner hair care bundles. Many properties of argan that make it great for shampoo are in actuality conditioning properties and not cleansing. 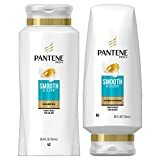 What is the Best Specialty Brand Argan Shampoo and Argan Conditioner? There is no shortage of argan oil shampoo reviews but where to start? We’ve broken down the different options by specialty products and drug store brands to cover all budget levels. Argan Oil Daily Shampoo by aVo Organics incorporates pure argan oil with other natural oils like jojoba and avocado oils for a nutrient rich shampoo. The product is not tested on animals and has a very light fragrance. With great moisturizing properties you may not need a conditioner to pair with it. CHI Argan Oil Shampoo is sulfate and paraben free. There is a stronger fragrance with this product than other argan oil shampoos. It is made with the same properties as CHI’s other shampoos but with the inclusion of argan oil. The product is great but the packaging can be a hassle. 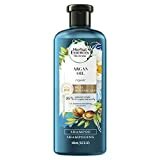 CHI Argan Oil Shampoo, 12 fl. oz. ART Naturals Shampoo is a good choice for all hair types. It has a mixture of argan, jojoba, peach and avocado oils and promotes hair growth. A good product for those with a variety of hair types but does not contain all-natural ingredients. A favorite product for many it’s free of parbens. It is a good choice for those with curly hair who want a product that will smooth and reduce frizzle. Truthfully you may not need to purchase an additional conditioner. Find the shampoo you like best first, and then evaluate whether an argan conditioner is needed for your hair type. What is the Best Drug Store Argan Shampoo and Argan Conditioner? When you see drug store shampoos lined up, there’s a good chance that many of them now list “argan oil” as one of their ingredients. If your budget can’t wiggle for specialty argan shampoos, these more affordable versions may be a good fit. It’s worth noting that all of these products are made with a mix of natural and artificial ingredients. Blended with a variety of antioxidants aimed to renew damaged hair, this argan shampoo is also paraben free. For those with frizzy hair, Pantene Pro-V’s formula is made to tame loose ends. One of the most popular drug store argan oil shampoos, OGX Luxurious Moroccan Argan Crème Shampoo and Conditioner helps smooth and shine hair. It is never tested on animals. Paired with conditioner this set moisturizes dry hair. It is made for all hair types and can be used daily.